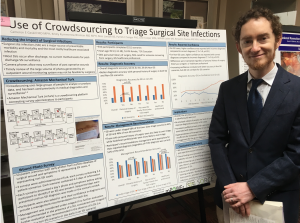 Patrick Sanger, PhD, presented our latest data at the 23rd Annual Schilling Resident Research Day in the University of Washington Department of Surgery. Lead author on the project, Dr. Cameron Gaskill, who is a resident in General Surgery at UW, is currently in Ghana on a year-long Fulbright fellowship to study global surgery. We were grateful for Patrick’s willingness to share our team’s work in Cameron’s absence, and we extend our sincere thanks for his critical contributions to the development of mPOWEr!